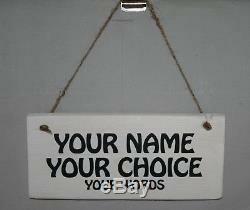 PERSONALISED Message Name Plaque Sign. Plain or white painted wood. 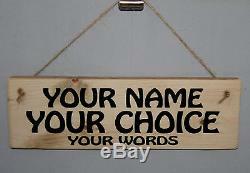 All the words & layout can be changed by request with your order. Simple silhouette graphics may be added - please ask. Ideal Christmas, Xmas, birthday gift made using new or rescued wood. Exterior Outdoor (or odourless indoor by request) Varnished Plaque Sign. 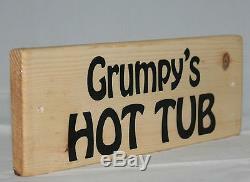 Great novelty Christmas, Xmas, birthday, occasion, thank you present made from new or recycled wood. Great for the garden, patio, Deck, gardening, shed, garage, pub, bar, gazeebo, extension, new greenhouse, new shed, etc. Good Quality Reclaimed Rescued Recycle Upcycle Rustic & New Wood Sign. Your chosen message in place of the examples shown. Please message us whilst ordering with name & message details and confirm drill holes. 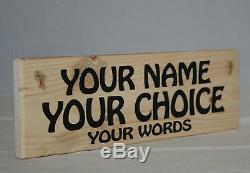 Each sign is made to order - please choose the wording & layout carefully. Please get back to us immediately if there is a problem with it. Note: If you are planning this as a gift, please order early to avoid delays and disappointment. 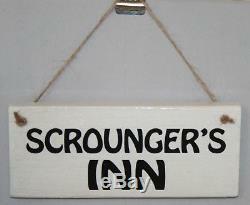 Please order early as it takes us up to approx 48 hours to make a personalised sign. And should be ready for dispatch by 2pm next day. Funky style pr int unless otherw ise requested - fonts can be changed by agreement. Please note that the photos are of actual items we made, not computer generated mock-ups. All our signs are handmade from solid wood not MDF, chipboard, hardboard or Plywood. Wood is much more resistant to weather conditions than MDF, ply, etc. (they will damage much quicker in the wet than solid wood). Not mass-produced so each piece is different and authentic. The wood grain and rustic effects are real and not painted or stained on the wood. We have deliberately left some of the print rustic on some as pictured to give it that rough and ready feel. Lightly varnished & unstained to help preserve the print. Outdoor rustic chic sign - can easily be preserved for more rugged outdoor use. Measurements are up to approx 26cm x 9.5cm x 2cm. Up to approx 10 x 4 inches. Drill hole front to back for hanging to door, shelf or wall. All the wood we sell has been reclaimed/rescued and worked by us. We have cleaned, dried, cut, drilled and sanded the wood ourselves. It's not known what type of wood it is, but usually they are some type of softwood. The wood may contain evidence of it's work history as we have pictured - this adds individual character in our opinion. This sound harsher than it is in reality - we are sure you will be thrilled by the sign you choose. Any unwanted characters should easily cover up with some careful use of paint or varnish. First class UK post is also available please select from the options available. PERSO NALISED MESSAGE SIGN Funky 8438549477700. The item "Any Personalised Name Words Sign Plaque Outdoor Garden Shed Den Bar Garage Shop" is in sale since Thursday, May 3, 2018. 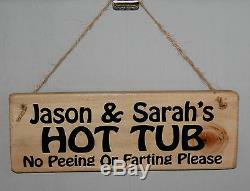 This item is in the category "Home, Furniture & DIY\Home Decor\Plaques & Signs". The seller is "crazymarlinchillout" and is located in Lancaster. This item can be shipped worldwide.